Today I’m wrapping up the series of tutorials that I’ve been sharing on my favorite image transfer methods. This last one, using clear acrylic caulk as the transfer medium, is a really wonderful and very permanent method, but it’s also more time consuming and a bit more physical. You really need to use a strong and heavy base to receive the image, and I especially recommend a canvas board or masonite. 1. Toner copies work best, so I recommend xeroxing your image. Like the paper transfers that we did, caulk transfers reverse the image, so keep that in mind as you prepare your picture. 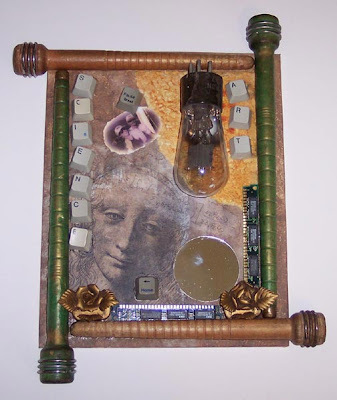 Paint the surface of your canvas and apply any other collaged images desired before doing the transfer. Leave a good deal of extra paper around your image so that it will be much larger than the caulked area. You need to avoid getting any of the caulk on the back side of the paper when you go to do the transfer. 2. Apply a thin but thorough coat of caulk to the canvas in the spot where the transfer is to be placed. Position the image ink side down and burnish well to remove all air bubbles. Let it dry overnight. 3. Tear off the extra paper and wet the paper backing thoroughly. Rub off the paper. You’ll have to rewet and rub several times before all the fibers will be removed. The image will be embedded in the clear caulk when you are finished. I would like to transfer my company logo onto a corn hole board (wood). Since the wood will be handled roughly, due to throwing the corn bags, is it possible to put a sealant of some kind on the finished transfer image? Also, Is it possible to do it on painted wood or should it be done on bare wood? You could do this on bare wood, Tammy, especially if you "prime" the area with a coating of varnish or urethane first, and then seal it with the same product. Sounds like a really neat idea to me! I am looking to transfer a poem that I have written and typed to a painting that I have already completed. My goal is to make the words appear on the painting without it looking like they are separate. No gloss. No lines. Would this process work? Without fading the paint through the rubbing, silicone, or water? Is your painting acrylic or oils? I can't guarantee that *any* image transfer method won't leave evidence like some gloss or visible lines. If you really want to try it, do a test with a dab of caulk on the same type of paint as your work to see how visible it is. These transfers are usually part of mixed media pieces that have lots of layers to help disguise the lines. Also don't forget that caulk transfers reverse the image, so you have to print it out backwards. 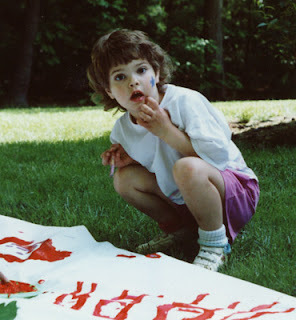 Maybe a dumb question, but wouldn't you consider just writing it directly onto your painting in your own handwriting? Very personal and unique. I successfully achieved this transfer process a year ago on multiple occasions. When I recently tried again the paper (and ink) never transferred to the caulk and simple peeled off. I feel as though I didn't do anything different and unsure why this time didn't work. I used an acrylic latex caulk. Seems others recommend a silicone. Any advice would be great, thanks all! I use silicone caulk because I like the way it grabs the ink. I don't know why your transfer didn't work unless the copy you were using wasn't a toner copy. Ink jets don't work well. Some xerox machines don't use toner anymore. Can't wait to try this method of image transferring. I've been playing with transferring images using gesso. 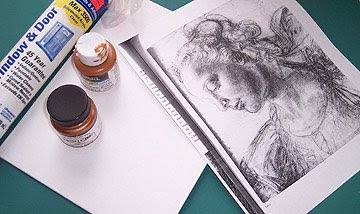 I discovered I can transfer rubber stamp images if I use a pigment ink to stamp my image on copy paper for the transfer.